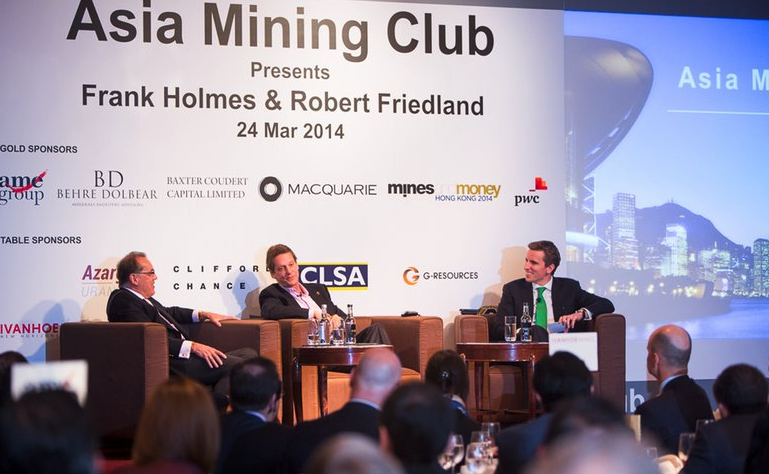 Don’t miss this rare opportunity to hear from and meet with two influential leaders in the mining sector. With the event expected to sell-out, be sure to register early to secure your seat. The discussion will be led by Asia Mining Club board member, Andrew Driscoll, Head of Resources Research at CLSA. Robert Friedland is the founder of Ivanhoe Mines Ltd. (formerly Ivanplats Limited) and has been the Executive Chairman and director since November 2000. He was formerly President of the company from June 2003 to May 2008. Robert Friedland was the founder of Ivanhoe Mines Ltd. (now Turquoise Hill Resources Ltd.) and served as Executive Chairman and Chief Executive Officer until April 2012. He directed the assembly by Ivanhoe Mines Ltd. of a portfolio of interests in several countries over 15 years and led the company's discoveries and initial development of the Oyu Tolgoi copper-gold-silver deposits in southern Mongolia. Frank Holmes is the CEO and Chief Investment Officer of U.S. Global Investors. Mr. Holmes purchased a controlling interest in U.S. Global Investors in 1989 and became the firm’s chief investment officer in 2001.